Jim Watson has devoted more than forty years to the youth and public of our community. He is recognized throughout central Illinois as an excellent official, coach, administrator and league organizer. An enthusiastic volunteer in Peoria, he's been a superb role model for our youth. Instrumental in a variety of sports essential to Peoria, Jim spent twenty-seven years in service as a coach, official and director of the Junior Football League. 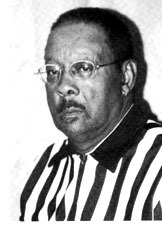 Primarily associated with basketball, he's served as a longtime scorer for Peoria Manual, helped to establish the Moonlight Basketball League, worked as chief statistician for both Bradley basketball and WMBD radio, and supervised activities for the Boys and Girls Club as well as Taft and Warner Homes. Numerous other contributions have been made to such activities as YMCA 1-ball, soccer and touch football, Carver Center, IBCA All-Star basketball, and every job imaginable for the success of the Gus Macker Tournament. Due to his tireless dedication and outstanding example to our community, we are honored to bestow the Neve Harms Award on Jim Watson.